Instead of building and designing bomb-laden autonomous drones, or humanoid robots like ATLAS who are probably going to overthrow humanity in a couple of years, researchers should be inventing robots like the Frobot vending machine that only exists to serve up frozen yogurt. The Frobot isn’t the first all-in-one machine designed to serve up frozen treats. Other companies have tried to automate restaurants like Pinkberry by completely re-inventing how frozen yogurt is made and served, but with little success to date as a result of over-complicating the process, resulting in expensive machines that are hard to maintain. So what does the Frobot do differently? If you’ve ever ordered a soft serve ice cream cone from an Ikea or a McDonald’s, the machines responsible for those tasty treats are secretly hiding inside the Frobot. It just replaces the hourly worker who served you your cone with an automated process, so to order a bowl of frozen yogurt you just need to make your selection from a streamlined touchscreen UI, and swipe your debit or credit card. 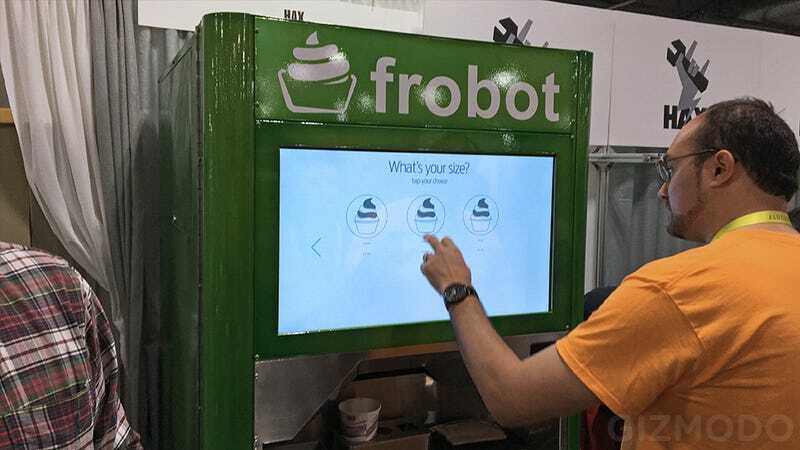 The Frobot can operate for up to 21 hours straight every day, with those last three hours needed for restocking the raw ingredients, and an automated cleaning process that ensures the machine is always operating properly and producing perfect frozen results. The cost of a bowl of frozen yogurt is left to whoever installs one of the $30,000 machines, but consumers will most likely be happy to pay a premium if left with a choice between a frozen treat, or a stale bag of pretzels in a neighboring vending machine.